Hearts welcome champions Celtic to Tynecastle on Wednesday night in the Ladbrokes Premiership. Craig Levein’s fifth-placed Jambos are hoping to reignite their quest for a Europa League spot after two disappointing results against Motherwell (1-2) and St Mirren (1-1). 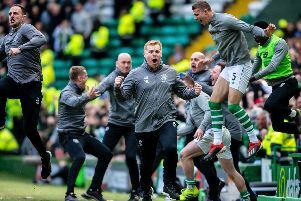 Celtic, meanwhile, are eight points clear at the top of the league and have only conceded one goal domestically this year. The Hoops come into the match in a bit of flux after manager Brendan Rodgers departed for Leicester City on Tuesday evening. The Parkhead hierarchy have moved quickly to replace him, with former Hibs head coach Neil Lennon appointed as caretaker until the end of the season. The Northern Irishman has yet to decide whether he will take a seat in the dugout for the match. Hearts team news: Craig Levein has problems on the left-hand side of defence. Demetri Mitchell is out for the rest of the season with a knee injury, Ben Garuccio is suspended and Jake Mulraney is nursing a hamstring complaint. Teenager Bobby Burns is likely to deputise. Right-back Michael Smith is still sidelined by a thigh issue, but Marcus Godinho is back in contention after being rested last weekend. Striker Craig Wighton is still continuing his recovery from injury and is unlikely to be risked, although fellow forward David Vanecek is set to return to the squad. Likely Hearts XI: Zlamal; Dikamona, Souttar, Berra; Morrison, Djoum, Haring, Burns; Naismith, Clare; Ikpeazu. Celtic team news: Midfielders Callum McGregor and Ryan Christie are out with calf and hamstring problems respectively, while Tom Rogic has a meniscus issue. Olivier Ntcham is toiling with a hamstring complaint while Marvin Compper (groin), Anthony Ralston (ankle), Filip Benkovic (leg), Kouassi Eboue (knee) and Daniel Arzani (knee) are out of action. Striker Leigh Griffiths is still sidelined due to personal issues. Likely Celtic XI: Bain; Toljan, Boyata, Simunovic, Tierney; Bitton, Brown; Sinclair, Burke, Forrest; Edouard. Magic number: Two – Hearts have won two of their past three home league matches against Celtic. Key battle: John Souttar has performed well in the centre of the Hearts defence since returning from hip surgery and he will need to be at his best to put the shackles on Celtic hitman Odsonne Edouard, who scored twice for Celtic at the weekend. Referee: Steven McLean – the whistler was recently in charge of Hearts’ 2-1 win away at Kilmarnock. Match odds: Hearts 5/1, Draw 3/1, Celtic 4/9.